» I thought the AUC would be effect because I saw the the black area in the below picture. Now i know the AUC is only depend on the dose as you said. Exactly. The input function does not appear in the basic equation of PK (AUC=ƒ·D/CL). Since after an i.v. 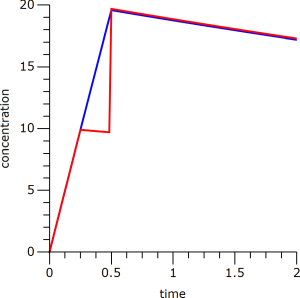 dose ƒ=1 (by definition) and the entire dose was administered, the AUC will be exactly the same regardless the input scheme. Note that the red line after tmax is above the blue one. With a t½ of 8 h the “missing” part before tmax will be outweighed in the elimination phase (speaking of AUC0–∞; the AUC0–2 will be lower, of course).